Brain regions active for an effective reading strategy. The Problem Solving and Learning lab is led by Dr. Jarrod Moss and is located in Magruder Hall at Mississippi State University. Research in our lab focuses on two main areas. The first line of research seeks to understand how people solve complex problems especially when the problem requires the generation of novel or creative solutions. The second line of research in the lab involves examining the neural correlates of employing effective learning and training strategies. 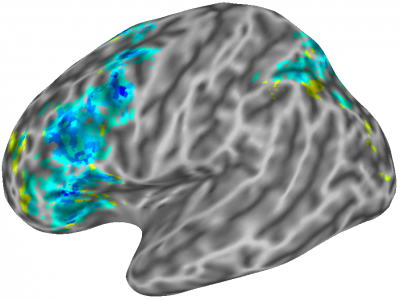 For both of these lines of research, we use neuroimaging tools to understand how these cognitive processes work. Read more about our research on the Publication and Research tabs above. If you are interested in joining the lab or in participating in our research studies, please click on the Get Involved tab above. If you are interested in the cognitive science doctoral program at Mississippi State University and want to discuss the potential of working together, please get in touch with me via email at jarrod.moss@msstate.edu. Be aware that the deadline to apply to our Cognitive Science doctoral program is December 1.